Using Hope as a Means to Success. As an organization, our target is to get 1 MILLION Job Seekers back into the workforce of their choosing. For our local Express Bloomington office , this initiative starts right here with you, in Monroe County! As Express Employment Professionals, we hold ourselves to a high standard that we always aim to hit and then surpass. We want to provide our Bloomington area with the absolute best workforce solutions out there, and we aren't afraid to put in the necessary work in to do so! Founded in 1983, Express today employs 500,000 people across over 800 franchise locations worldwide. Our long-term goal is at the heart of our company's vision, to help as many people as possible find good jobs by helping as many clients as possible find good people. Express Employment Professionals in Bloomington, IN works with job seekers to help them find the right job for their skills and experience. We have a variety of jobs available, and there are full-time, part-time, and temporary positions available. 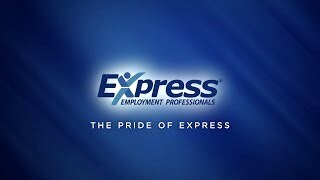 And, as one of the leading staffing agencies in North America, Express provides employment services and workforce solutions to employers throughout our community. Contact us today to get started on finding the right fit for you. Bloomington, Indiana - Lets Get You Back to Work! Employers from our area come to us looking for staffing services and our Job Seekers come to us looking for work, our Express office is able to do both at an exceptionally high rate because of two key factors. The first is that like the businesses that seek out our staffing services, we too are a locally owned and operated company. The second is that while we are a local business, we are lucky enough to have access to a network of international proportions! Having these two factors going for us, we are able to give our community a unique staffing experience that you won't find to get outside of Express. An example of this is our four-step ISO:9001 certified hiring process. This essential process allows us to analyze the needs and skills of our Associates so that we can successfully match them with local jobs that would best fit both Job Seeker and Employers short-term, long-term, or temporary staffing requirements. If there's an agency out there that’s going to provide the best practices for staffing or give workforce advisement to our local businesses, it’s going to be our team at Express Bloomington! At Express Bloomington, we believe you should never stop learning new things, which is why we offer a sizable selection of free webinars, simulcasts, and other career development resources that were created specifically to teach useful information on subjects relevant to work related tasks. “Employee Morale and Engagement”, “Communicating With and Getting the Most From Your Employees”, and “Conflict Management” are a few of the subjects that we offer - for FREE. We also have Lunch N’ Learn, which is a program that can be done in your office that covers a range of topics, like “Generations in the Workforce”, “How to Be the Employee Your Employer Can’t Live Without”, and “Learn to Lead” - also FREE of charge! Call our Express Bloomington team today to have your staffing needs taken care of!